The 5-star campsite L’Anse du Brick and its beach with fine sand welcomes you in a warm, cozy and informal setting in the high and low season in an authentically preserved Normandy. L’Anse du Brick offers holidays with indoor heated swimming pool, animations (in July and in August), children’s playgrounds as well as many other activities and quality performances, so you can count on an unforgettable holiday in Normandy. 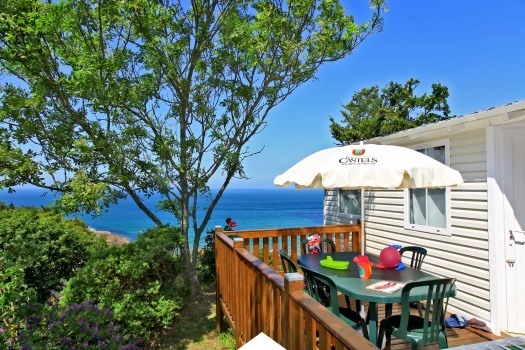 The campsite L’Anse du Brick located on the Normandy coast near Cherbourg (10 min) is one of the most beautiful campsites on the Cotentin peninsula. L’Anse du Brick campsite offers rentals, various mobile homes for up to 6 people, but also camping pitches for tents, caravans and motorhomes for holidays with family or friends. Located at 3.30 hours from Paris, L’Anse du Brick is the ideal place to get together with your loved ones and unwind. At L’Anse du Brick campsite you can relax for just a weekend or a all week with all the facilities at hand and experience the taste of nature elements and feel the sea character of the place. Member of the high quality camping chain «the Castels», L’Anse du Brick is a domain of prestige holidays. Hospitality, living in the french way in a lush environment are the most important principles of a Castel Camping. L’Anse du Brick offers you various facilities and services of high quality. The covered heated swimming pool, heated accommodation and camping pitches, of which the Premium camping pitch in particular will seduce you with its beautiful panoramic sea view. Please note, we recommend that you reserve your desired accommodation as soon as possible, so that you are assured of availability of the sea view one’s. L’Anse du Brick also offers you a 5-star water park, with a heated, covered swimming pool and a water slide, which opens onto a heated outdoor pool. There is a paddling pool for the little ones in the indoor pool. For adults there is also a corner of the pool : the balneo with jets and waterfalls with hydromassage, anatomical bench and massage plate for the feet. For the children, the 5-star campsite L’Anse du Brick has a kids club in high season with different activities all organized within the safe areas of the campsite. In the afternoon there are sporting activities for the whole family and between 2 and 3 evenings a week a fun evening entertainment, which ends at 23.30, to ensure your sleep. The campsite L’Anse du Brick offers you 2 restaurants with an amazing view of the sea of the Cotentin, freely accessible to anyone. The campsite has a bar with terrace, which is adjacent to the swimming pool and where you can relax enjoying one of the many cocktails on the menu. In addition, the campsite offers you various facilities and relaxation areas, so you can spend pleasant moments with family and friends during your holiday. A game room, electronic games and board games are lent and offer everyone enough possibilities to enjoy. Outside there are playgrounds, where the young children can play in complete safety. Finally L’Anse du Brick, your campsite by the sea in Normandy, offers you direct access to the beach, which is located in a sheltered bay, where you can practice various water sports. L’Anse du Brick promises you the quality and comfort of a Castel Camping and offers various services such as hospitality and accessibility for disabled people. For a perfect holiday, your pets are also welcome, provided they are kept on a leash at the campsite. L’Anse du Brick campsite is close to the landing beaches and to a large number of other cultural and sporting activities that contribute to a successful holiday. The location of the campsite offers you a choice of numerous activities. The Cité de la Mer in Cherbourg with the famous submarine ‘the Redoutable’, the landing beaches of the Second World War, such as the beach of Utah Beach or the American cemetery Colleville sur Mer are the important tourist attractions of the Normandy region, perfect for lovers of history and discovery. 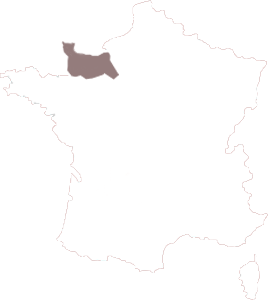 There are more interesting sights and regional tourist attractions in the region, whether they are in the Calvados or Manche. The Mont Saint Michel and its bay are impressive for beautiful walks at low tide. Also the Island of Tatihou (accessible via the port of Saint-Vaast-la-Hougue). Visit the Anglo-Norman islands and be amazed by their wonderful natural landscapes. For lovers of nature, there are several parks and gardens in the immediate surroundings of the campsite. Go for a walk in nature following the hiking trails of the coastal area. For the most sporty person there are sports fields (football, volleyball, pétanque …) that are located on the campsite. Outside the campsite you can take the famous hiking trail GR 223, which runs along the entire Normandy coast, from the Manche department to the Calvados department. On this road you will find Barfleur, which is one of the French most beautiful villages. 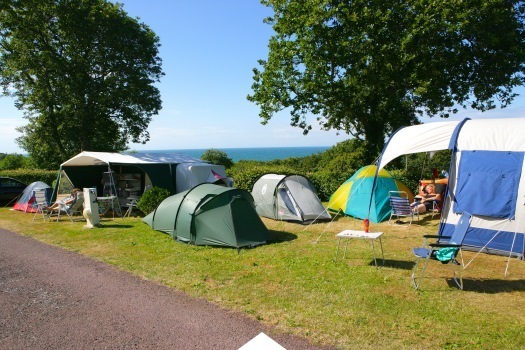 The campsite is geographically very favorably situated, you can discover typical Norman villages and towns such as Bayeux, Lisieux or Deauville, Trouville and Honfleur. At L’Anse du Brick, your campsite in Normandy, you will find wonderful to combine relaxation and discovery in a region rich in cultural heritage. Discover grades given by our customers as a result of their stay at L’Anse du Brick. Get an idea of the quality of our services! The transactions on this website are secured. Check the availability of our accommodation in real time. Every year L’Anse du Brick receives prizes and nominations by camping and caravaning institutions.